Great blog post from Shure – Five Essential Mobile Recording Rules – is about recording live music. Even if you're not into recording live music your event videos, man-on-the-street interviews, documentaries and indie films rely on audio captured live in the field. His "Rule #5: Your work is your calling card" is good advice for anyone in the production business. The rest of the article is just as useful. Check it out and maybe save your next on location project from disaster. I just read a great article from Davida Rochman on the Shure blog called Recording Sound Elements for Video. Only, it's really about using sound elements to create a layered audio track – like shooting video with a narrow depth of field to create texture and focus. Most everyone shooting video on a DSLR likes bokeh – the strange name for the way backgrounds go soft and out-of-focus with some lenses and camera settings. While not every video should be shot with lots of bokeh, it turns out that all good audio tracks benefit from having a clear focus surrounded by softer layers of sound. And this article tells you exactly how to do that. It's a longer article but well worth the time. When you learn how to capture and use sound elements to kick your production value up you'll make your projects sound like a professional production rather than a home movie. This is a very good explanation of how shotgun microphones work – a little bit dry but the information and examples are solid. It's from Shure so the mics used are Shure shotgun models but all shotgun microphones work the same way. In five minutes, you'll have a good idea of how this useful tool can improve your productions. Any questions or comments? Leave them below and I'll get back to you. I am happy to release a new ebook! Discover how to choose the right microphone and put it in the right place. Get this right and you're already ahead of the game. You can focus your audio just like you focus your shot. And when you do your audio tracks will be immediately better. There's a simple way to set recording levels correctly so you're getting the best possible quality recordings. You'll see why it's important to monitor the audio all the time and why this pays off when you get to post production. Add these two simple tricks to your production skills and your audio tracks will start to sound like a pro put them together. Make a plan and follow it. Good advice and this chapter will show you the most important questions to ask to make sure your plan works great. Be kind to your tomorrow-self and learn how to improve your audio workflow for the entire production process. ​There's no cost and no email required. Just click to download the PDF. 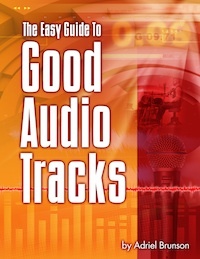 Spread the word – let everyone that needs to create good audio tracks know they can start here. I recently came across the web site Auphonic.com and was pretty blown away by what you can do there. So I decided to test the results of their online processing against the latest version of Adobe Audition CC. I tested three audio files, each with different sound issues. The results were pretty interesting. Leave your comments and questions below. And thanks for stopping by! I am interested in purchasing two of the Sennheiser G3 mic systems. I have done so much research and it seems if I need quality audio then they are the cheapest I can get for excellent quality. I will be conducting interviews with these two systems but I am a bit confused to how I set up two systems into one DSLR (I have a Canon T3i) camera. Is there some type of audio splitter I need to purchase that plugs into the camera? Also, is there a shoe mount that will let you mount two transmitters. I don't want to spend all this money and then have one transmitter fall and break. Zoom H6 – Does this work for you? Just came across a couple of new videos from Zoom for their new H6 – the portable six-track recorder with interchangeable modules. The first one has good information about the product features. From the looks of it, Zoom has address several real-world issues – having a physical knob to turn for setting level is so much better than pushing buttons and watching a level indicator move up and down. This one doesn't have a much info but it's kind of fun! I know this may seem like too much recorder for some people. But if you're looking to move up from a Zoom H1 or H2 this could make a lot more sense than a Zoom H4. If you just use the extra tracks a few times you'll be happy you have discreet tracks when you get to post. I see several places on the web have it priced at $399 USD. They're taking pre-orders for delivery expected by July 31, 2013. So, what do you think – is this overkill or could you use some of these features? ZOOM recorders dominate the DSLR video market. And the new ZOOM H6 looks like it will have the competition playing catch-me-if-you-can. 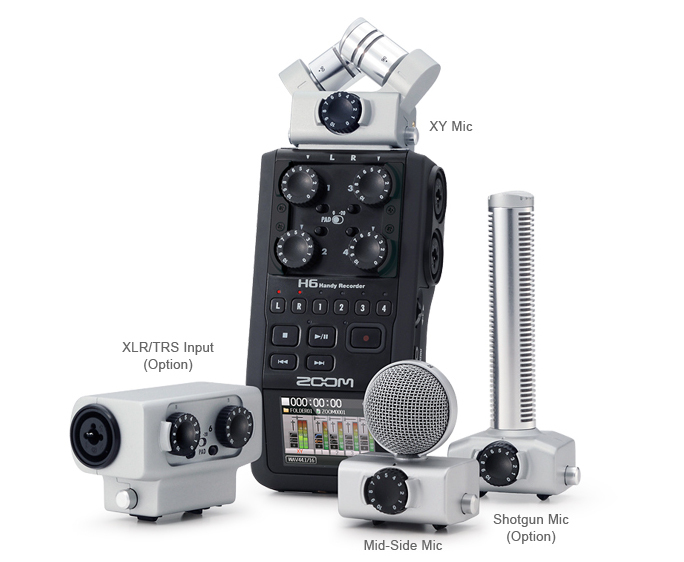 There are a couple of features here that may make this a perfect recorder for you. First, this recorder has interchangable microphone heads. If you're using a recorder to capture sounds in many different circumstances and would like to choose from a variety of modules to match the situation, this could be a perfect solution. Second, one of the modules adds two XLR/TRS inputs to the four already on the unit. If you need to record six channels of simultaneous audio this feature alone could make the ZOOM H6 your new best friend. Is this the perfect solution for DSLR audio? Forget about the legendary Shure quality construction. Forget about the all metal case. Shure has topped everyone by including a digital recorder inside their new VP83F shotgun microphone. Mount it on your DSLR, plug in your headphones, tap the output and feed it to your camera, and you're ready to create great audio.